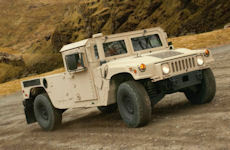 The M1152 is an Expanded Capacity HMMWV enhanced with Integrated Armor Protection as a Cargo or Troop Carrier. It is a two-man vehicle used primarily to transport personnel, but can also be used as a shelter carrier. The M1152 provides superior troop protection and is capable of carrying up to eight passengers under the Armor Troop Carrier or Troop Seat options. The M1152 is an Expanded Capacity Enhanced IAP/Armor Ready cargo/ troop carrier/utility vehicle. The M1152 can carry up to eight passengers with the Armor Troop Enclosure or Troop Seat option. As an Expanded Capacity Vehicle, the M1152 is specifically designed for use over all types of roads, as well as cross-country terrain, and in all weather conditions without sacrificing mobility, dependability or performance. The M1152 payload varies by armor configuration and fragmentation kit, ranging from 3,340 to 5,100 lb. The M1152 is air transportable and droppable, and can be sling-loaded by helicopter. The M1152A1 provides superior troop protection. With the addition of the “B” kit, the M1152A1 provides gapless mine and ballistic protection. The additional armor and fragmentation kits are field installable and removable to provide flexibility for missions that do not require heavy protection. The vehicles are equipped with an A/C system to provide greater crew comfort. The M1152 expanded capacity, enhanced truck is used to transport personnel. The M1152 provides the capability to secure and transport the S250 electrical equipment shelter. For higher payload capacity, the M1152 is equipped with a reinforced frame, crossmembers, lifting shackles, heavyduty variable rate rear springs, shock absorbers, reinforced control arms, heavy-duty tires and rims, and a transfer case and differential with a modified gear ratio. The optional front winch permits recovery operations of similar vehicles. Fully-loaded M1152 utility trucks will climb road grades as steep as 40% (22°) and traverse a side slope of up to 30% (13.5°). The vehicle fords hard bottom water crossings up to 30 inches (76 centimeters) without a deep water fording kit and 60 inches (152 centimeters) with the kit. The M1152A1 expanded capacity, enhanced, IAP/armor ready is used to transport personnel. The M1152A1 come equipped with Integrated Armor protection (IAP) which provides added ballistic protection for armament components, crew, and ammunition. The M1152A1 vehicles are capable of transporting a two-man or four-man crew and eight passengers. The M1152A1 provides the capability to secure and transport the S250 electrical equipment shelter. For higher payload capacity, the M1152A1 is equipped with a reinforced frame, crossmembers, lifting shackles, heavy-duty variable rate rear springs, shock absorbers, reinforced control arms, heavy-duty tires and rims, and a transfer case and differential with a modified gear ratio. The optional front winch permits recovery operations of similar vehicles. There are major differences between the old and the new models which deserve a thorough inspection. At first glance, there doesn’t appear to be a difference in the two models that is until a closer observation reveals an air conditioning unit riding the transmission tunnel, in the center of the passenger compartment. The new model also sports a larger front air distribution duct, improved front heater and evaporator assembly, reinforced front body mounts, and new heavy duty 12-inch tall variable rate rear springs. It almost describes a civilian version with one major exception; each M1152 comes with a factory-installed Integrated Armor Package [IAP]. The IAP covers the underbody, rocker panels, and lower windscreens to provide the frontline warriors improved protection against Improvised Explosive Devices, according to the information provided by Kindred. Armored doors can be added too, as the Hummer has been assembled with reinforced ‘A’ and ‘B’ pillars as well. Now one might think that with the added weight, an estimated GVW of 11,500 pounds, that it would affect the vehicle’s frame and performance. Not at all when adding a 6.5 liter turbo-charged diesel engine on an expanded capacity vehicle frame, similar to adding extra strength to a vehicle for off roading. These are the most noticeable differences between the old and new vehicles and there is more; it looks sportier too. With the type terrain the frontline warriors travel, the constant probability of encountering IEDs, and extreme weather conditions in the Global War on Terrorism, the manufacturers have listened and produced a vehicle such as the M1152 to provide the protection and comfort they need to survive longer in those conditions. The M1152A1 and M1165/M1165A1 were never intended to be armament carriers. So there is no ring mount that can be used for M1152A1 and M1165A1 HMMWVs.